Former Dean Jack Saddler established a task force to investigate and report on the options available for improving the written and oral communication skills of undergraduate students in the four degree programs in the Faculty of Forestry. This writing guidebook is one of the outcomes of this initiative. It was produced under the guidance of the Faculty of Forestry Communication Skills Task Force in cooperation with faculty members, students, and other individuals on campus. Support for this project has been provided by a grant from the University of British Columbia’s Teaching and Learning Enhancement Fund. 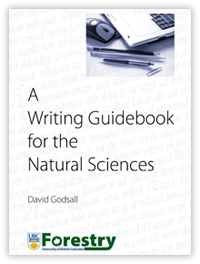 Download the Writing Guidebook for the Natural Sciences.